You may find these 4-out, 1-in zone offenses helpful in counteracting zone defenses, especially if your main man-to-man offense is a 4-out, 1-in motion offense. You can stay in your familiar 4-out set, but run it a little differently against zones. A 4-out zone offense would also be helpful if you have a shortage of post players (foul trouble, injury, etc). Several 4-out zone plays are also included. This is one way of using the 4-out, 1-in set to attack zone defenses. This offense has a pattern and continuity. Refer to the diagrams below which show this offense vs a 1-2-2 zone defense. We start in our familiar 4-out set with O1 and O2 on the top and O3 and O4 at the wing-corner areas (Diagram A). O5 starts on the weakside low block. O1 dribbles at the X1 and X2 (trying to get the defenders to commit). 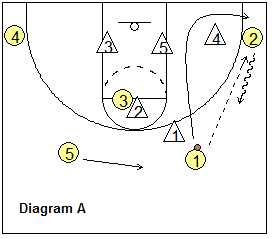 O5 flashes into the middle of the paint, and if open, O1 could pass there. Notice that O3 has also crept down to the weakside low block. But let's say O1 passes to O4. Notice that the X4 defender will probably come out to guard O4. O5 cuts to the ball-side low block and posts-up for the possible pass from O4. But let's say the defense is solid and the pass goes back from O4 to O1 (Diagrams B and C). Now O3 flashes to the middle of the paint and O5 slips back to the weakside block. O1 could pass to O3 in the paint or, if X5 defender comes up on O3, O1 could make the lob pass over the top directly to O5. Diagram D... O3 could shoot or pass to O5 on the opposite block. Diagram E... let's say the pass from O1 to O3 is denied. O3 cuts back outside and must avoid the 3-second call. The ball is swung over to O2 and then to O3. Diagram F... O5 posts-up on the ball-side block while O4 slips down to the weakside block. As the ball is passed back out to O2, O4 now flashes to the middle of the paint while O5 slips to the weakside low block (Diagram G). Again, the pass could go from O2 to either O4 or directly to O5. O4 could shoot or pass to O5 (Diagram H). If the pass from O2 to O4 (or O5) is denied, O4 cuts back out to the corner, O5 moves to the weakside block (Diagram I), and the ball is passed from O2 to O1. We are now in the same setup that we started with in Diagram A and can continue to run this pattern until something is open. Or we can go into our "Corners" offense (below). Here is another 4-out, 1-in zone offense that is less-structured than the patterned offense, and is easy to teach. Refer to the diagram to see the basic set-up for this offense. We use four perimeter players and one post player. We can run this really against any zone defense. It is different from our "4-out" motion offense in the way we run it. In the 4-out motion offense (vs man-to-man), we are looking to pass, cut, screen, etc. In 41 "Corners", we do more outside passing and the post player inside follows the ball. The post player moves as the ball moves. When the ball is on top (O1 or O2), O5 should locate at high-post, ball-side elbow area. If the ball is passed to O5 at the high post, O3 and O4 should be thinking about a back-cut to the hoop if they are being denied the pass. O5 passes to the back-cutter for the easy lay-up. Against the 1-2-2 zone, O5 should be able to get open between the two defenders at the high post, free-throw line area, or by cutting into the center of the paint (in the middle of the box created by the four defenders). Also, we ought to get the ball to the corners. When the low defender comes out, O5 again can dive to the ball-side low block looking for the quick pass from the corner. Against the 1-3-1 zone, O5 may have an easier time getting the ball down on the low block, since there is only one down defender. This offense should create alignment problems for the 1-3-1 zone as we have O1 and O2 on either side of the top defender, and our corners O3 and O4 are set lower than their outside wing defenders want to be, which should cause problems for the wing defenders. Here too, we ought to get the ball to the corners and look to shoot or pass inside to the low post from there. Against the 2-3 zone, O5 will have a better chance to get the pass inside at the free-throw line or in the gap just below the elbows. Since there are three down defenders in this zone, it would be pretty hard to post up on the low block. However, if the ball is in the corner and the outside low defender goes out, then O5 should dive to the ball-side low block looking for the pass. These various zone attacks are choreographed in the animated diagram. The first three plays are run out of our Corners 4-out offense vs the 2-3 zone defense, and are so simple that I call them "Larry", "Curly" and "Mo". Oftentimes it's the simple things, when executed correctly, that work the best. Our team this past year had several very good outside, 3-point shooters and we used these simple plays to get wide-open 3-point shots. 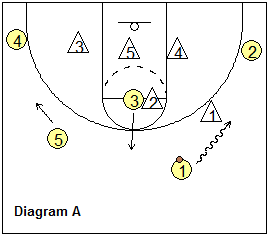 41 Zone Play - "Larry"
Here is a simple set play you can run vs the 2-3 zone. We are in our "Corners" 4-out set. O1 passes to O2 in the corner (diagram A), which gets the low outside defender X4 to come out and guard O2 (who is a good shooter). O2 dribbles up to about the free-throw line extended, lifting X4 up, as O1 cuts inside and to the ball-side corner. O2 passes back to O1 in the corner (diagram B), and usually O1 will be open for the 3-point shot. 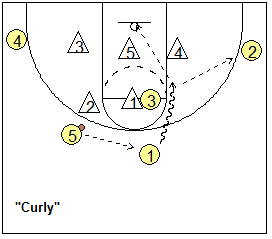 41 Zone Play - "Curly"
Here is a another simple set play you can run vs the 2-3 zone. Again, we are in our "Corners" 4-out set. We initially pass the ball to O5 and get the X2 defender to guard O5. Usually the 2-3 zone will have X1 deny the pass into the high-post, so we have our high-post player O3 pin-screen X1 (see diagram above). O5 passes back to O1 and O1 dribbles around the pin-screen for the open pull-up jump shot, or O1 could also pass out to O2 in the corner (especially if X4 comes up to defend O1) for the open 3-point shot. 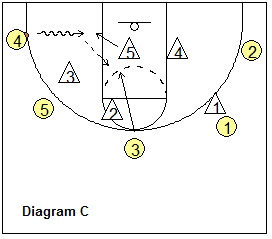 41 Zone Play - "Mo"
Here is a another simple set play you can run vs the 2-3 zone. Again, we are in our "Corners" 4-out set. Now this time, we are going to have our high-post player "step out", and we get a 5-out look as we overload one side of the zone. We start with O1 dribbling a little toward the right wing and O5 moving toward the left wing (diagram A). O1 dribbling right gets X1 to go with him/her, and so X2 will have to defend the next pass to the top. O5 steps out on top and gets the pass from O1 (diagram B). O3 quickly swings the ball to O5 (left wing). Now the X3 defender has a problem... either we get the uncontested 3-point shot from O5, or if X3 closes-out on O5, O5 passes to a wide-open O4 in the corner. If O4 is a shooter, he/she can shoot the 3-point shot, or otherwise attack the baseline with the dribble for either a pull-up inside jump-shot or a power lay-up against the X5 defender. After the ball is swung to the corner, O3 dives inside and could get a pass inside from O4 on the baseline dribble-penetration (diagram C). 41 Zone Play - "Corners 52"
Here is a set play you can run vs the 2-3 zone. See the diagrams below. Note that we start in our 4-out "Corners" offense. O1 passes to O2, while O5 slides up and screens X2. O3 slides down to the corner. O4 cuts underneath the zone to the ball-side block. O2 dribble-penetrates the seam, looking for (1) the pull-up jumper, or (2) the pass to O3 in the corner (if X5 drops inside), or (3) the pass to O4 cutting underneath the zone (if X3 comes up to defend). "Stack", "Star", "Wing Flash", and "Weak" submitted by Mark Lane. 41 Zone Play - "Stack"
Here is another 4-out, 1-in zone play that you can run against the 2-3 zone defense. See the diagrams below. O1 passes to O4 (diagram A), and O4 dribbles left to get the zone to shift. O3 and O5 double-screen the low right defender X4 inside (diagram B), as O2 cuts along the baseline to the right corner. Meanwhile, O4 passes back to O1. O1 dribbles right and could pass to a wide open O2 in the corner for a 3-point shot. Otherwise, if the X4 defender moves out to O2, O5 screens the middle low defender X5 (diagram C) and O3 cuts into the open slot for a pass from O1, and an open inside shot. 41 Zone Play - "Star"
Here is another simple, effective 4-out, 1-in zone play that you can run against the 2-3 zone defense. O4 pin-screens the top left defender X2 (diagram A), and O1 dribbles around screen attacking the gap. There are a few options here. O1 might have an open pull-up jump shot just inside the left elbow area. If the outside low defender X3 moves up to defend O1, O1 could pass to O2 in the corner for an open 3-point shot. If X3 stays low and X5 moves up (diagram B) to help defend against O1, O5 should be open for a pass inside from O1. 41 Zone Play - "Weak"
This play is similar to "Star" above, but here O5 starts on the weakside (left) low block. O4 cuts through to the opposite (right) block. 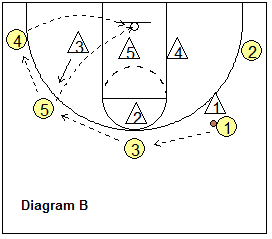 O5 moves up and pin-screens X2, and O1 dribbles around the screen, attacking the gap. As in "Star", O1 may have a pull-up jump-shot, or O2 may be open in the corner for 3-point shot, or O4 could get open inside for the pass from O1. 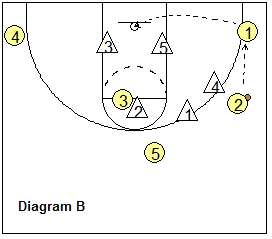 41 Zone Play - "Wing Flash"
This 4-out, 1-in zone play is also run against the 2-3 zone defense. See the diagrams below. O1 passes to O4 (diagram A), and O4 passes to O2 in the corner. O3 flash-cuts to the ballside elbow (diagram B), and O5 cuts underneath the zone to the ballside short-corner and gets the pass from O2. Once O5 gets the pass, O3 dives inside for a quick pass from O5 and the lay-up (diagram C). Also O1 cuts to the weakside block and might be open if the X4 defender slides over to defend O3.